I turned right on Hereford Street and approached that iconic left-hand turn onto Boylston Street. But I didn’t run through Kenmore Square to get there, and it wasn’t Marathon Monday. It was Monday though, two weeks after the marathon, and I was dodging past lunch goers as I ran down the Back Bay sidewalks, on break from my Boylston Street office a block past the finish line. I didn’t know this would be how I would find my way back to that spot where I stood two weeks ago cheering for other runners that persevered through 26.2 miles. Until a few days ago, I didn’t know how I would ever walk down this street again or shop at my favorite running store. I couldn’t will myself into the “normal” everyone keeps talking about. It was my love of running that led me to be close to the finish line on Marathon Monday, and it’s my love of running that is helping me heal. The day after the marathon, I laced my new Boston-edition Kinvara running shoes that I had bought from Marathon Sports as part of a limited-edition marathon promotion. I hadn’t had a chance to break them in yet. Unable to focus on work, I ran from my suburban home to the commuter rail station and headed back into Boston to retrieve my abandoned car, purse, and laptop from a back entrance to our office building in the cordoned-off crime zone. The day before, while my coworkers were busy being productive, I took a break to cheer for the finishers. The flagged-lined finish was too crowded, and I found a spot on the corner of Exeter and Boylston, behind three kids huddled up to the barricade. Some runners approached the finish line with a smile, some with their cameras poised, and some barely able to run. The crowd cheered for a woman who had slowed to a walk, and she resumed a jog as she crossed the finish line. The little boy in front of me had found something interesting to play with on the ground. His brother lightly kicked him, and the boy shoved his brother back. Their mother held their 3-year old sister’s hand next to me. When the sharp sound ripped through the air, I turned my head to the left and saw a billowing pillar of smoke rise as high as the building facade. I instantly knew it was a bomb. My brain did not hesitate or mistake the danger for something else. The mother beside me yelled, “Run kids.” I picked up the boy in front of me and sprinted. His brother’s homemade sign exclaiming “Go Daddy” fluttered to the ground. The second explosion rose in another tower of smoke, blocking the direct path ahead of us. I stopped, frozen on the sidewalk. With a stranger’s child in my arms, I was paralyzed. I couldn’t move. I couldn’t run. I didn’t know where to go or how to protect the boy or myself. Whether it was mother’s instinct or just instinct, the woman with the kids ushered us through a store door. I grabbed her coat sleeve, like a grown child, still holding her child, and we ran into the basement. Inside, we sorted through our panic, tried to call loved ones, and faintly masked our fear to help the children. Ten minutes later we were outside running again toward the river. Eventually, we all made it home safely. I abandoned all my things and borrowed six dollars from another woman I now call a friend, too afraid to go back into my 10-story office building. A quick run on the Friday after the marathon, just to get out of the house and unglue myself from the anxiety and desperation I felt as I waited and silently pleaded for the capture of the fugitive suspect. Normally a 10k runner, I fatigued at 4½ miles, and my tendinitis-plagued knees flared at 6½ miles. “Feel your knees ache,” I said to myself. “Feel your legs and your feet.” I thought of the spectators who will have to work so much harder than me to walk and run and dance again. I ran farther and longer than I ever have. And I knew that no workout will ever be too hard for me anymore. It was this leisurely Sunday run where I realized I had racked up enough miles to achieve 26.2 before the two-week anniversary of the bombing. At that moment, I knew I had to run down Boylston Street to finish my miles. I had to do it before 2:50 pm on Monday the 29th. I had to run past the spot that paralyzed me into fear. 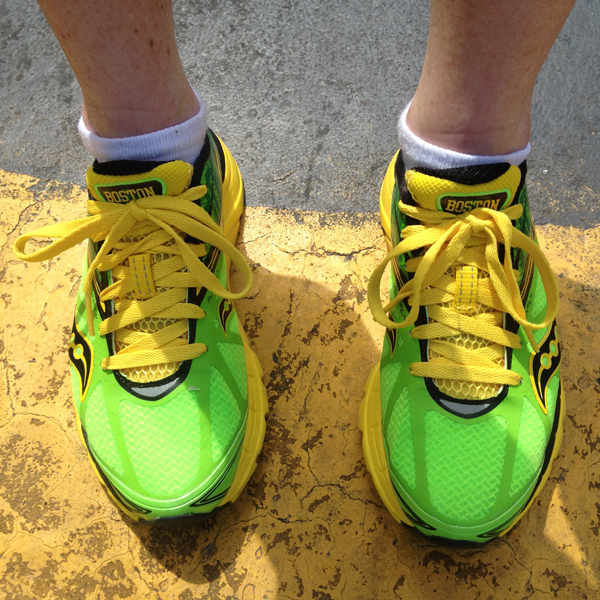 I had to cross the marathon finish line in my Boston shoes. After a beautiful run along the Charles River framed in white and pink blossoms, my legs willed me down Boylston Street, past the site of the second bomb, past the spot where I became one of the lucky ones, past the freshly cemented sidewalk where the first bomb exploded. With tears streaming down my face, I crossed the faded yellow finish line in front of silent onlookers paying their respects to the site. It took two weeks, five runs, and four hours and 27 minutes, but I ran 26.2 miles. This may be my only Boylston Street finish, but it is a victory. And I did it in these shoes. Boston Strong.